Many moons ago when the internet was relatively young, there was a thing called a MUSH.. a multiple user shared halucination. A game basically set in whatever background the players wanted, like Star Wars for instance. Reenactment is a lot like a mush because it relies on willing participation of a great number of people any of whom could go out of character/setting and off on a random tangent, it was also mainly run by narrative agreement, no one could knock your character unconscious for instance unless you went along with them doing it, You have to play the game, be part of a bigger story but still with some leeway to act individually. We are all here to have fun. 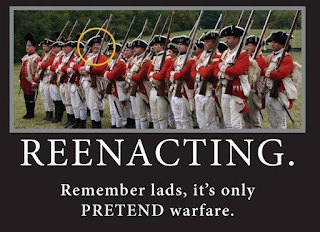 In reenactment nothing is really enforced by law (unless it is unsafe). I have never seen anyone refused from taking part due to poor kit but this is because people want to support the hobby and experience the life, including proper gear, and maybe I have been fortunate in my experience. If you see a packet of hobnobs on your camp table do you..
A) Cover them up because they are spoiling it for your sense of time/place. B) Cover them up for the public really, it's expected of the group. C) Leave them because you are having lunch and people shouldn't have to do things at lunch. like at work. D) Put a pair of jeans and a tee shirt on and sit and eat the biscuits. if you are not being in reenactor mode people shouldn't mind (see Jena 2016) and your fellows are probably too polite to tell you to go elsewhere. Sentiment good, but you've still spoilt that photo! Playing the game is meeting a certain standard and taking part seriously.. yet also not TOO seriously. Your not really in the army, respect your officer but remember his name is Gary and he's a shoe salesman from Norwich. I have also had members of the public say that some groups are friendly to the public whilst others blank them completely, I have seen this, seems to differ from unit to unit. Sometimes people are busy, some people are shy, but this should seldom reflect on the whole group. if you are all making rounds up have one person tell those loitering public what you are doing and why. They have come to see you. This weekend gone we fought several units of Austrians and they played the game well. They knew what was required of them and when they had to take casualties and be thrown out of the town, that is exactly what happened. They did it with a (concealed from the public) smile and didn't need repeated assaults before making a reluctant retreat. No one is going to think less of your unit and its pretend fighting skillz because in the officer's meeting that morning it was decided that unit x would be beaten up. If you want to play to win go and do airsoft. This is more like theatre with a bit of improv than a sport. We are all here to have fun, that does not mean lowering standards, but remembering why you are here and why people come along to shows. There is a hazy wall between whatever century you are in and the rest of the world, sometimes it must be broken for the public, sometimes for other reenactors, the challenge is knowing when it is the right time.